LEADING IN: 1987 saw the Eagles and the Panthers back on track, having good but not great years, the injury lists weren’t nearly as long, and by November both teams were in the thick of things for the playoffs. They both suffered tough losses the previous week; the Panthers lost in overtime (Arizona Playoff style) to Kingman (coached by the Coconino Kid, Ray Smith) in the Dome, 17-16, while the Eagles played a game more closely resembling water polo than football at Mingus (the field was under five inches of water) as they lost, 15-9. Despite the losses, they still were in the mix for postseason play. The Eagles came in at 5-4 and had returned to running the ball. Healthy contributions came from Robert Cottrell and Robert Allsup, but the star of the backfield was Pup Gill. 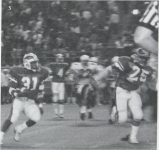 In nine games, Gill had rushed for 1,137 yards and 16 touchdowns. Behind center, senior Mike Caputo was playing his third year of varsity ball and completing 51% of his passes to Blue Van Dyke and the rest of the receiving corps. Their defense was solid, allowing just 15 points a game, led by leading tacklers Allsup and Jason Walthour. Coconino’s offensive output was anemic in comparison; Gill by himself had outrushed and outscored the entire Panther squad, and they were passing at a 40% completion rate. Their strength was in their defense; while they also gave up 15 points a game, they did so with greater aggression. They forced more plays for loss, more sacks, and more turnovers than did the Eagles. They were led by senior linebacker Chris Weller, who came into the game with 126 tackles, more than Allsup and Walthour’s totals combined. The bitter taste from last year’s loss to the Panthers lingered in the mouths of Caputo and Gill all year long; as a sophomore, signal-caller Caputo came off the bench to lead the Eagle offense to ten second-half points and a win in 1985, but was injured and missed out in ’86, while Gill’s crucial fumble in the third quarter allowed the Panthers to break open a close game at halftime. And while the Panthers were in good position for a playoff berth, they came to the Rivalry Game at 4-4-1 and did not want to notch a second straight losing season. The Daily Sun had named the Eagles the slight favorite; let it be known, however, that at this point, Coconino had won the annual battle ten of eighteen times, and seven of those wins came as the underdog. THE GAME: The Eagles used Gill early and often. The senior tailback ran the ball nine times in their opening drive and threw once on an option pass before they stalled on the Coconino 6 and kicker Eddie Messman missed a 23-yard field goal attempt. Gill sliced up the Panther D in the first half, racking up 105 yards, but a key fumble in the second quarter snuffed out another drive. They dominated the Cats (Coconino netted just 11 yards total offense in the first half), but they went to the locker room with a meager 5-0 lead. Messman kicked a 39-yarder in the second quarter to get the Eagles on the board, then the Panthers just handed them two points when, deep in their own end and facing fourth-and-23, quarterback/punter Donald Penny stepped out of the end zone. The Panthers started to get themselves on track in the third quarter. Penny led a drive that started on their own 11 and should have ended with a 24-yard touchdown pass to Andy Wachter to put them ahead, but instead of a score, a flag for holding gave them a second-and-23 that killed their momentum. The Eagles got the ball back and continued the running attack, and after a 28-yard Gill run set them up on the Coconino 2, Allsup punched it in, and they led 12-0 after the extra point. Just as Penny was revving up the Coconino offense, he had to leave the game with a bruised ankle. When the Panthers got the ball back after the Allsup touchdown, backup Bryan Henson took over and got Coconino back in the game with a 55-yard scoring strike to speedy wideout Myron Hansen; for as horrible an offensive show as the Panthers had presented thus far, they were only down 12-7 with a minute gone in the fourth quarter, as they had not shot themselves in the foot with turnovers and their defense was rising to the occasion. That defense held the Eagles on their next possession, but the Panthers couldn’t do anything with the ball either, so they punted as well, giving the Eagles the ball at midfield. Four Gill runs put them on the 5, where Allsup pushed through for his second score of the night. Coconino made one last furious attempt to come back. With just over a minute left, a Henson pass was tipped at the line of scrimmage. Hansen snatched it and made like a bat out of hell. He was finally caught at the Flag High 12, 63 yards downfield. That was the Panthers’ last gasp, as they were unable to convert. AT THE END OF THE DAY: Both teams made the playoffs, but Flag High’s venture was stranger than usual. The Eagles finished in a three-way tie atop the division with Kingman and Mohave. The tie was settled in a mini-playoff the following Monday in Wickenburg; Flag High and Kingman would play a 20-minute game (two ten-minute halves), the winner securing a playoff spot and playing Mohave later in the day. Flag High beat Kingman, thanks to Gill’s efforts, rushing for 173 yards on 19 carries and scoring the Eagles’ lone touchdown from 73 yards out in the first half ; Kingman scored on a 76-yard screen pass, but with just over five minutes left in the game, the Bulldogs’s coach Ray Smith opted for a two-point conversion to take the lead, a conversion that ended with an incompletion and Flag High winning, 7-6. In the second game, Mohave ran all over the Eagles, chalking up 229 yards on the ground, and came out with a 20-0 win and a home game against Flowing Wells on Friday. Flag High hit the road and went to Tucson to play the #6 Cholla Chargers. For all their trouble with the three-way playoff, they were humiliated, 58-6; everything that could go wrong for the Eagles, including Caputo going down in the first half with a sprained ankle and Gill gaining only 15 rushing yards all night (he finished with 1,362 for the season), did.